Airsoft GI – Week 2 Raffle Winners Announcement! Airsoft GI would like to give a special Thank you to our sponsors: Echo 1, Ares, KWA, G&G, Spartan, OE TECH, and TSD for making this Beat the Heat Summer Promotion Possible. Real Action Paintball is proud to announce the release of the new T68 SplitFire Dual Feed Paintball Marker. T68 SplitFire AK47 Dual Feed Paintball Marker features a dual-source ammunition feeding system, capable of providing two different types of .68 caliber ammunition at the turn of a dial. The T68 SplitFire AK47 can carry two types of ammunition simultaneously, and allows the operator to select the most effective projectiles for the situation – then change back as needed, at the turn of a dial. When the situation changes, so can your ammunition. Immediately. Full metal mp5k by Cyma! Airsoft GI – Raffle Commercial Part 2 and Exciting New Releases! Steelhawk Airsoft’s Rancho Cucamonga Grand Reopening! Spartan Imports – LWRC M6A2 AUTO BLOWBACK! SPARTAN IMPORTS NEW PRODUCT SPOTLIGHT: LWRC M6A2 AUTO BLOWBACK! Now on the Spartan Imports YouTube Channel is our spotlight on the Classic Army LWRC M6A2 with Auto Blowback! This spotlight covers the internals, externals, and functionality of this hot new model from Classic Army! Here are some products online, they are the Prime CNC Metal Body for WA M4 GBB with Colt Defence trademark. The new metal body also has a different color coating which is semi gross black which is more realistic than before. The other one is the Bomber custom M16VN GBB, if you are Vietnam fans, don’t miss this great replica, the upper and lower receiver are both made by CNC process, to remind you, this is limited edition. Furthermore, we just stock in the Bomber speed bolt for WE SCAR, the original WE SCAR bolt is made by steel which is very heavy. Hence ROF is comparatively slow. Bomber has made an aluminium version speed bolt so that the ROF of the SCAR after installed the speed bolt is dramatically increased. This is especially obvious when using japan 134a gas. We do offer discount when you buy a WE SCAR with the speed bolt. So, you can install the speed bolt in CQB game with weaker gas so your enemy won’t hurt too much and use green gas in jungle for longer effective shooting range. About Magpul-PTS, just a quick update, the long waiting Magpul ACS stock will be available next week, Rhino Airsoft is now taking pre-order. The Magpul PTS ACS (Adaptive Carbine/Storage) is a drop-in replacement for the standard M4 AEG stock body. The second one is the Magpul UBR in DE, it’s now in stock and ready to ship, limited supply. In every purchase of the AI Tornado Grenade, a free spoon kit and maintenance kit will also be supplied along with your AI Tornado Grenade. This offer expires on the 31st August, make your order now before the offer ends! Also, there are only a few days left on the August Deals of the Month where you can save up to 50% and check out the 40% prize reduction for their HFC Dark Hawk! 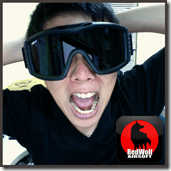 Become a fan of RedWolf Airsoft! Not only will you get regular updates on what’s happening over at RedWolf with our reviews, bite the bullet articles and new video updates. But you will also get Facebook specific raffle draws every 1000 fans they get on their page! The first draw has already been done and a lucky guy over in France will be claiming his SocomGear 1911 MEU some time soon with us and with our fan base figures on Facebook reaching almost 6000, we’ll soon be making the next draw for our lucky winner. Sign in to Facebook now and become a fan today! Having returned from another memorable film-sim game organised by Gunman Airsoft (with thanks to First and Only for offering up The Asylum), I thought it was only fair to this time write a review. I’ve tried to be as honest as possible about this event, and what I hope comes out of this is that the event was a greatly enjoyable and a very memorable experience from the perspective of the Communist troups. I’ve been highly impressed by Gunman’s Filmsim events (so much so that I’ve attended every Cold War event so far, and intend to continue doing so, despite the lengthy drive down to Suffolk / Kidderminster), and I’ve yet to experience sim events of this calibre elsewhere. There’s few people so committed to getting the experience right that they would plough cash into buying considerable kit for people to use, and this is reflected in the experience I’ve had at each of their games. You can read the full review here here.